Born on a Monday of this date in 1921, Jimmy Jamieson was a hard-hitting defenceman who played just a single big-league game, with the New York Rangers, in 1944. When he suited up that winter for duty on the bluelines of Madison Square Garden, Jamieson almost certainly became the second Indigenous player to play in the NHL, 13 years after Buddy Maracle debuted in Rangers’ blue in 1931, nine years before Fred Sasakamoose skated for the Chicago Black Hawks in 1953. During his hockey career, newspapers tended to refer to Jamieson’s Cayuga background, though Canadian government records seem to show that his family was Mohawk. He was born in Brantford, Ontario, though his family lived on the Six Nations of the Grand River reserve, probably near Ohsweken. His father, Venus, was a farmer who’s said to have chased pucks in his own right, plying a stick on outdoor rinks as a youth. His son’s eight-year career as a minor-league defenceman took him to New York and Baltimore in the Eastern Amateur Hockey League, out to Pasadena for a stint in the Pacific Coast Hockey League, and to Milwaukee and Akron in the International Hockey League. While we have have his physical specs from those years (5’9” and 170 pounds), and the usual bare-bones statistical reporting, there’s no detailed descriptive accounting of Jimmy Jamieson’s hockey years. He played one full season, 1943-44, with the Rangers’ farm team, the EAHL New York Rovers, and it looks to have been a solid one. The Rangers took him to their pre-season training Winnipeg that year, but he didn’t make the cut. With the Rovers his teammates included goaltender Al Rollins, who was later a Leaf and a Black Hawk, as well as defenceman Fred Shero, a Ranger-to-be who’d eventually win a pair of Stanley Cups coaching the Philadelphia Flyers. In 40 games, Jamieson was the highest-scoring defenceman, with six goals and 16 points, and led the team in penalty minutes with 73. Frank Boucher was in his fifth year coaching the New York Rangers in 1943. While he’d steered the team to a Stanley Cup in his first year behind the bench, things had slipped since then. As the new year replaced the old, the team was, as the local Daily News put it, firmly cellared, dead last in the six-team NHL standings, 13 points adrift of Chicago. 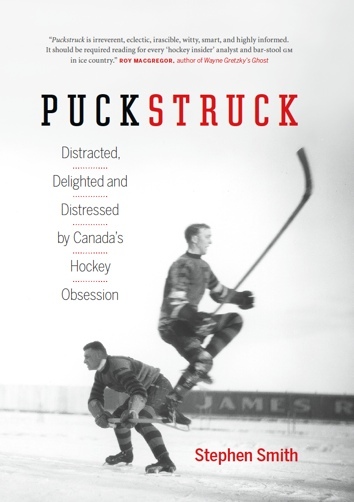 Though Boucher’s stellar career on the ice had ended five years earlier, the situation was so desperate in New York — and the Ranger roster so depleted by wartime manpower shortages — that Boucher had returned to the ice at the age of 42. It wasn’t enough. Heading into a mid-January home game against the Black Hawks, New York was mired in a five-game losing streak. Trying to jolt the team’s fortunes, manager Lester Patrick announced that he was adding three new players to the roster, including winger Kilby Macdonald, who’d been on that 1940 Stanley Cup team and won the Calder Trophy as the league’s top rookie. With centre Hank Damore, acquired from the Brooklyn Crescents of the EAHL, he’d do his best to boost the Rangers’ attack. 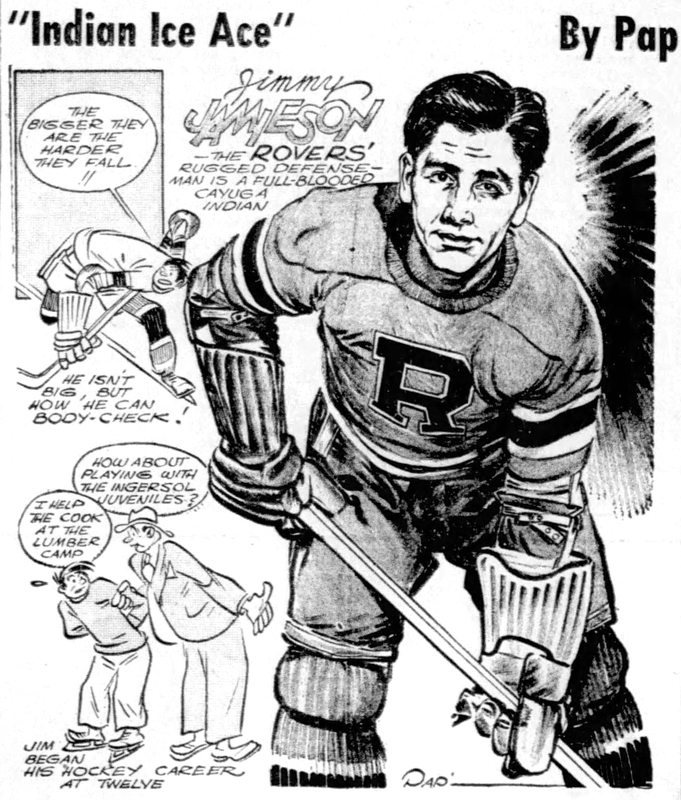 Jamieson was summoned from the Rovers to bolster New York’s blueline. Against Chicago, when Damore rifled a second-period shot past Black Hawks’ goaltender Mike Karakas, the assists went to Ab DeMarco and Jamieson. That made the score 4-1 for Chicago, and the visitors did end up winning 5-2 to push New York’s unhappy streak of losses to six games. And that was all for Jim Jamieson in the NHL. Macdonald would stick, playing out the season in New York and returning for one more; Damore lasted four games in all, the only ones he played in the NHL before returning to the minors. For Jamieson, it was one and done: following the Chicago loss, he was returned to the Rovers. The coming-and-going was nothing new, Harold Burr wrote that same week in The Brooklyn Daily Eagle; the way it was with the Rangers that year, he quipped, trainer Harry Westerby didn’t know half of the players’ first names. Other factors that may have been at play: by adding three new players, Patrick does seem to have exceeded the NHL roster limit. With centre Chuck Scherza out injured, the Rangers’ long-serving captain Ott Heller had been moved up to the forward line. With Scherza’s return, Heller was shifting back. So it may have been a matter of numbers that bumped Jamieson back to the Rovers. Accounts of Buddy Maracle’s career from a decade earlier make the racism he faced, in rinks and in newsprint, all too insidiously clear. That there’s nothing so explicit in the press attending Jamieson’s years as a professionally hockey player doesn’t mean that he didn’t experience any, just that it may not have been written down and reported as it once so casually was. I can’t tell you much about Jim Jamieson’s post-hockey life, other than that he seems to have done some coaching in Brantford in the 1950s. He died at St. Joseph’s Hospital in Brantford in December of 1985 at the age of 64. He’s buried in a family plot at Six Nations. Also worth a note: Jamieson’s brother, elder by seven years, was also a talented hockey player. Mostly a right winger, Wendell Jamieson was (somewhat confusingly) also mostly known as Jimmy during his hockey-playing days. He never made it to the NHL, but he did have a long career as a minor-leaguer through the 1930s and ’40s, much of it in the old American Hockey League. In 1938-39, the elder, non-NHL Jimmy Jamieson joined the Detroit Holzbaugh of the Michigan-Ontario Hockey League. At 24, he was described as a fast skater and accomplished stickhandler, and seen as one of his team’s prime offensive threats. Anchoring the defence of one of the teams he faced that year, the Detroit Pontiac Chiefs, was a 34-year veteran with “an oft-broken nose” who’d converted from left wing to blueliner: Buddy Maracle.